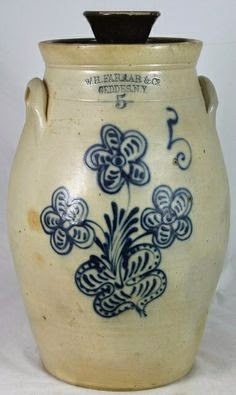 Isaac, married Eveline Farrar of Middlebury, Vt.
Farrar, 1850's 5 gallon butter churn with triple flower design all in great blue. 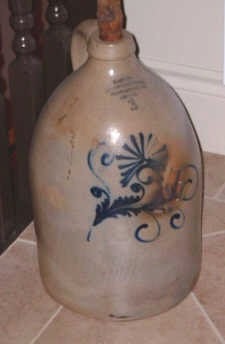 Sold for $850 at Waasdorp's American pottery auction on 10/2010. March 1, 2014 Stoneware Auction by Crocker Farm, Inc.
Jacques Boisvert notes: A bill of sale is shown dating August 26 1840, from the VERMONT STONE WARE firm, owned by Georges W. & J. H. Farrar of Fairfax, Vermont. From that bill we note that the 2 gallon jug was selling for $43.00 a dozen, which is about $0.35 each. 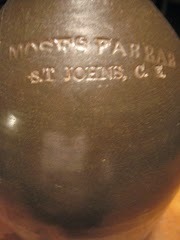 The father Isaac Farrar started pottery business. He was in Enosburgh, VT, in 1798. Farrar was the first clerk of that town and his daughter was the first white child born there. We do not know in which year he moved to Fairfax, but according to a jug kept at the Brooklyn Museum (NY) marked I.B. Farrrar & Sons, we may guess that it was around 1815, as his sons would not have been old enough then to be in business with their father. His son Ebenezer Lawrence (E.L.) and the one bearing the initial J.H. were in business in 1840 as the bill noted mentions.Eventually Ebenezer Lawrence (E.L.). bought the Farrar & Soule pottery at St. John, Quebec and George Whitefield (G.W.) Farrar. his brother became associate with him in 1857. In a small publication entitled: LA POTERIE AU QUÉBEC, une histoire de famille we can read: "It is impossible in the first years of "Farrar pottery", to trace a clear demarcation line between the activities of the Canadian and American Farrarr. The story of these potters of St. John, Quebec is closely related to the potters of Vermont. Two Farrar brothers, died in the burning of a steamboat on the St. Lawrence River. This ship bore the name "THE ST.LAWRENCE". They were among 200 victims that loss their life in that incident. George Whitefield Farrar came of a family whose roots in North America went back to the 17th century, to Jacob Farrar, who emigrated from England to Massachusetts in or about 1653. In the 18th century George’s father settled in Vermont and eventually established a pottery at Fairfax. It was at this pottery that George received his training. He continued as a potter in Fairfax until the 1850s, when he crossed the Canadian border to Saint-Jean (Saint-Jean-sur-Richelieu). Other members of the extensive Farrar clan had for some years been engaged in potting there and had introduced the making of stoneware to the area. In 1857 he entered into a partnership in Saint-Jean with his potter-brother, Ebenezer Lawrence Farrar. The partnership was announced in the Saint-Jean News and Frontier Advocate as effective from 13 April 1857. It was short-lived, for less than three months later Ebenezer lost his life in the burning of the steamboat Montréal on the St Lawrence. George W. Farrar carried on the business in Saint-Jean, and across the Richelieu River at Iberville after fire destroyed the Saint-Jean plant in 1876. He was joined, when they were old enough, by his sons; the two who had most to do with the pottery were George Henry and Ebenezer Lawrence. At various periods the pottery was officially operated under his sons’ names, but he always maintained an interest in it. After his death it continued in the family name until 1926 when George H. Farrar sold it. The pottery closed in the early 1930s. 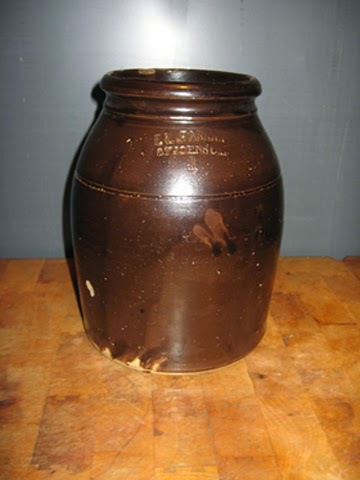 The Farrars’ products were the common earthenware and stoneware of the North American potter Articles produced were almost entirely utilitarian: snuff jars, bottles, spittoons, jugs, teapots, butter pots. Within this range, quality was good. 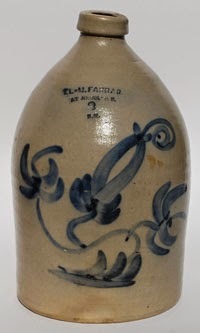 George W. Farrar was awarded a medal for earthenware at the provincial fair in Montreal in 1860; under his sons’ names the factory’s stoneware was exhibited abroad, at Philadelphia (1876) and Paris (1878). In 1861 the pottery used up some 500 tons of clay (stoneware clay was imported from New Jersey) and employed 18 hands. By the 1870s steam power had been installed and 40 persons were on the payroll; the pottery was now one of the largest in Canada. But George W. Farrar’s accomplishments did not end with the production of dark-bodied earthenware and salt-glazed stoneware. He was the promoter of the St Johns Stone Chinaware Company, the first whiteware pottery in Canada, established in 1873. 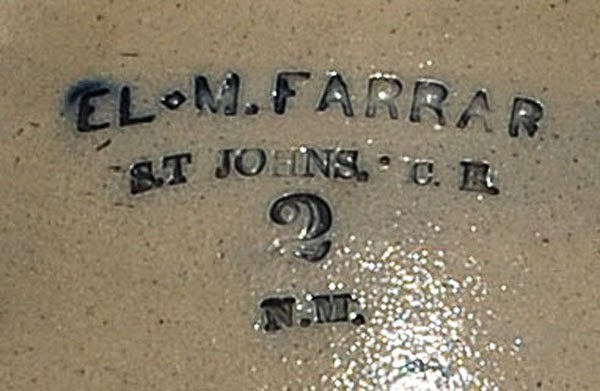 Because, like most Canadian potters, Farrar never made much money, he lacked capital to embark on such an ambitious venture as the formation of the company on his own, but his was the moving spirit behind it. Much of the required capital came from Edward C. Macdonald, the company’s president and a “merchant prince” of Saint-Jean, who bought the company outright when it slipped into bankruptcy in 1877. Farrar himself was connected with it for only a brief period – he withdrew early to take back the management of his own pottery – yet his had been the vision of a new dimension in Canadian potting: the first commercial production of whiteware. 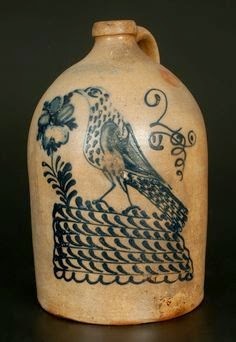 A beautifully decorated two gallon jug from E.L. & M (Ebenezer Lawrence and Moses) Farrar of St. Johns Canada East. Circa 1855. Decorated pieces from this short-lived early partnership are rare. The quality of this design suggests it may have been a special piece. The initials "N.M" are the potter's. 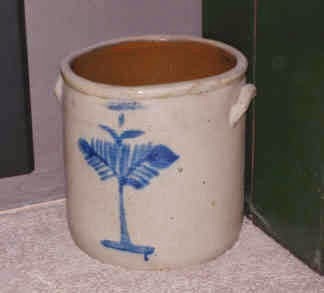 Farrar Redware Crock Made at L.W. Farrar Pottery (1831-1850), Fairfax. Incised mark: "L. W. Farrar." 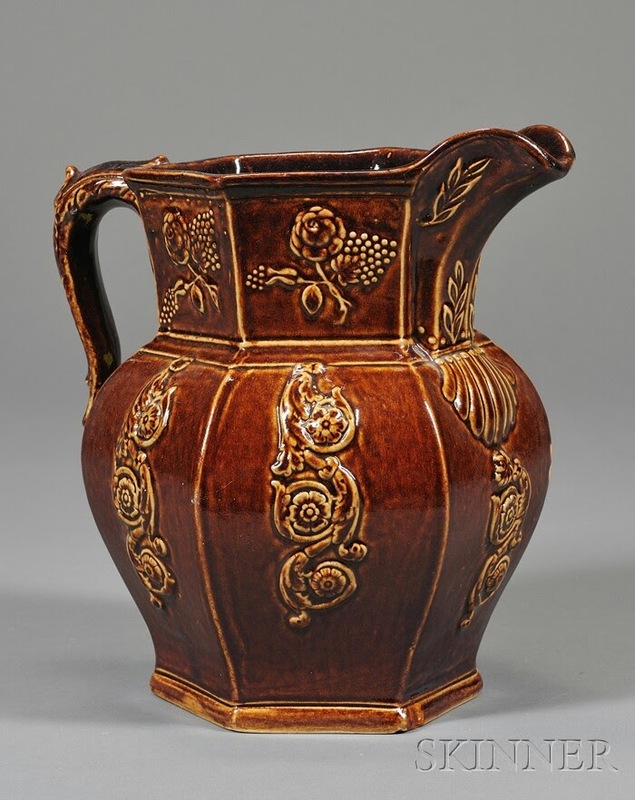 FAIRFAX POTTERY FALLS INTO 2 CATEGORIES: 1 - Red Earthware fashioned from native clay. Native clay was found in river beds and near large bodies of water. 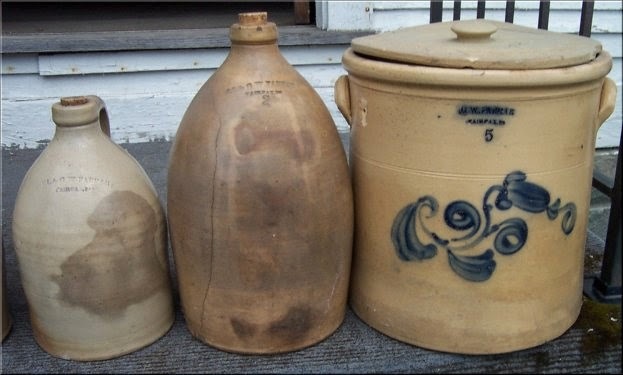 Redware is one of the least durable ceramic types. Porous and brittle, it easily cracked and chipped. Red earthware has not survived in quantity. It was intended for the humbler domestic purposes. The local glacial clay was also used for common bricks. 2 - Stoneware made with materials brought from outside the New England states. This material was transported from New York, New Jersey and Pennsylvania. Isaac Brown Farrar, son of Rev. Stephen Farrar, was born March 27, 1771. He was born and raised in Ipswich, N.H. He left New Hampshire in the year 1798. I.B. Brown was a potter. Isaac Broun Farrar appeared in Enosburgh, VT in 1798. No one knows when he appeared in Fairfax, VT. I.B. Farrar had a son, Isaac Brown, who married Eveline Farrar, a cousin. Eveline's father was Caleb Farrar of Middlebury, VT. Caleb was a well-known potter. Other sons were Ebenezer Lawrence, Stephen and George W. J. H. Farrar (1840) may stand for another of Isaac's boys. Records indicate that Isaac Broun Farrar, Sr. died in 1838 at 67 years of age. Ebenezer Lawrence Farrar did business under his own name and also in partnership with G. W. Farrar. 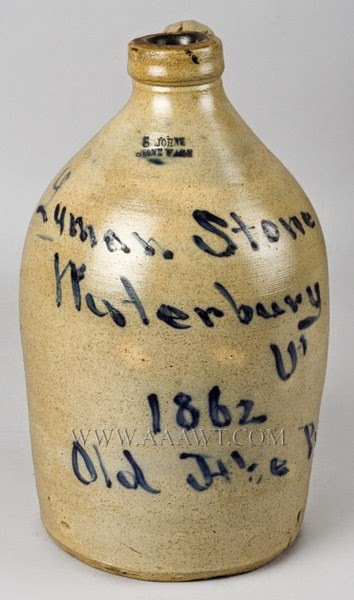 In 1852 E. L. Farrar was in Burlington, VT., where he built a pottery work for the firm of Nichols and Alford. Another Farrar, whose given name has not come to light was in partnership with one Stearns in 1851 and 1852. He may have been the son of Ebenezer Lawrence Farrar. Farrar & Stearns can be found on pottery. They made stoneware. Lewis & Cady were also stoneware manufacturers. Pottery with their names can also be found. 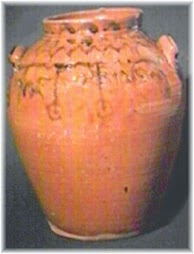 Bostwick was also a name associated with Fairfax Pottery. 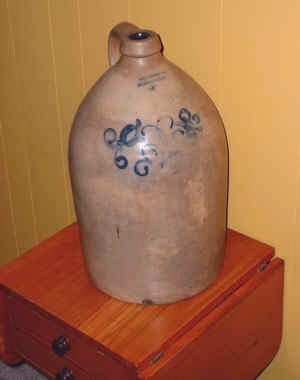 Fairfax Historical Society has a piece of Bostwick Stoneware. 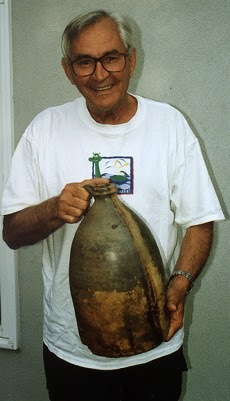 The above information was provided by Marvin Alderman, formerly of Fairfax who is extremely knowledgeable of pottery. "ONONDAGA - POTTERY CO. 1841, in Syracuse, New York, W. H. Farrar operated a pottery to make Rockingham. 1855 -1871, the plant was called the Empire Pottery. 1871, the plant was re-organized and the name changed to Onondaga Pottery Co. 1966, the name became Syracuse China Onondaga Pottery made china dinnerware. 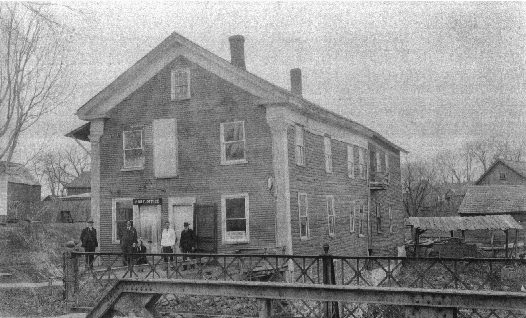 Caleb Farrar established a pottery in Middlebury, Vermont, about 1812, for the manufacture of earthenware and white tableware. About 1850 Farrar sold the works to James Mitchell, who continued the business until his death, after which the pottery was purchased by Nahum Parker. The buildings were afterwards converted into a dwelling house, which is now or was recently occupied by Mr. P. V. Hathaway, who married a member of the Farrar family. Among other varieties of ware, green glazed pottery was at one time produced there. A specimen may be seen in the collection of the Pennsylvania Museum, Philadelphia. This is a mug of common earthenware covered with a yellowish, apple-green glaze. 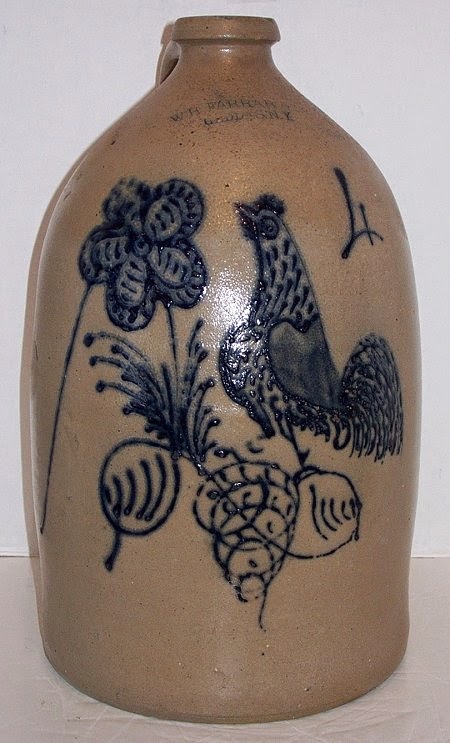 4 gallon jug made by the W. H. Farrar & Co, with the incredible full bodied dotted rooster decor, just sold for $11,750.00 - This one was manufactured in Geddes, N.Y, not Fairfax, but by the same company that originated in Fairfax then expanded and moved to both St. John's, P.Q., Canada and Syracuse, N.Y.
"Early New England Potters and their Wares"
I have E L Farrar 2 crock has been cracked and glued. Is it worth anything ? Buried at Battleground National Cemetery in Washington, DC is George W. Farrar, was a Corporal in CO. G, 43rd New York Infantry when he was killed in action, July 12, 1864. He was a Potter from Bedford, Canada.